Each year, Park's kindergartners monitor the eggs, the hatching, and the growth of resident goslings — honing their observational skills and laying the foundation for scientific thinking. Children learn in different ways and they develop and grow at different rates. The role of Park's teachers is to recognize and encourage each child’s particular strengths, while supporting growth in all areas. They're inquisitive, show and earn respect, and are mature beyond their years. They are bright, motivated, naturally curious, and love to explore – always asking "What if? and "How and why?" and Why not?" Park teachers stand apart because of their great passion for teaching and learning. They truly connect with students, provide insight and guidance, and encourage them to think critically for themselves as they learn by doing. To fully understand a complex time in history, third graders learn the points of view of colonial settlers, Native Americans, and enslaved Africans through extensive research — including building shelters modeled after those of Eastern Woodland Indians. Upper School student tutors staff and run the Michael Cardin ’85 Writing Center, working with Lower, Middle, and Upper School writers in a variety of settings. Here, a student tutor works with a fourth grader on developing her writing. The fifth grade theme curriculum focuses on the acquisition of social and cultural understanding of the medieval world through authentic research and the application of multiple disciplines, including engineering. Current Park teachers have, on average, over 20 years of teaching experience. 75% hold advanced degrees. They publish. They research. They present. They perform. And more. Appalachian Challenge is Park’s nationally-recognized outdoor education program that is constructed, maintained, and led by students. Middle Schoolers take Challenge as a P.E. requirement, and many become Challenge Leaders. 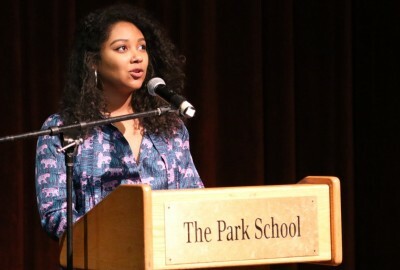 Park's motto, A Sound Mind in a Sound Body, manifests itself throughout the Middle School curriculum. The eighth grade physical education program is elective-based — allowing students to explore their varied interests, including canoeing on Park's pond. In 9th and 10th Grade, students have the opportunity to put science in the context of real life through authentic inquiry and central, culminating experiences, including studying the digital analysis of motion on Challenge Course initiatives. At Park, the arts are an essential part of our daily lives. They frame our experience of the world, serve as vehicles for personal expression, and enhance our exploration of all of the academic disciplines. Upper School students can choose from an array of mathematics electives such as Calculus, Advanced Calculus, Advanced Discrete Mathematics, Abstract Algebra, Linear Algebra, and Topology and Knot Theory, and more. Park students raise questions, engage in research, and collaborate with scientists and policy-makers from around the world. Follow the link below to learn more about our students' ongoing permafrost and toxicology studies in the Arctic. Learn about Park alumni as they pursue further academic achievement, develop professional pursuits, and continue the process of choosing for themselves from the wide range of possibilities life offers. Get a glimpse of Park's educational philosophy in action and a "first look" at our academic settings on our 100-acre campus. Parents take a guided tour with a Park School administrator. Register now! A springtime opportunity to visit campus, take a nature walk, listen to a story, and create art. The event is designed for children ages 3–6 and their parents to experience Park. To understand the Park approach to education, the sense of community here at our school, and the opportunities to discover one's best authentic self, get to know a Park student. By supplementing family tuition contributions, our Tuition Assistance Program seeks to make a Park School education affordable for families from a wide range of economic backgrounds. Explore. Visit. Learn more: click for video. The goal of the Park Kindergarten program (Pre-K – Age 4; Kindergarten — Age 5) is to stimulate the healthy growth of each child's intellectual, social, physical, emotional, and ethical powers. In grades 4-12, our interscholastic athletes work to bring home championships, win rivalry games, and finish each season with records that make both team members and the community proud. Faculty gathered this July to report on summer work, to share ideas, and to implement new initiatives. Since 1912, Park’s core values have sustained an unshakable belief in children’s capacity to enjoy learning, to act rationally, and to grow when inspired by highly qualified, caring teachers. Founded in 1912, The Park School of Baltimore is an independent, coeducational, non-sectarian, progressive Pre-K through 12 school located on a 100-acre campus minutes from the city. Park students are inquisitive, comfortable in their own skin, show and earn respect, and are mature beyond their years. They are bright, motivated, curious, and love to explore — always asking "What if?" and "How and why?" and "Why not?" By immersing students in a challenging curriculum and surrounding them with a dedicated, impassioned faculty, we create an environment that enables them to become their best authentic selves. Having experienced diverse perspectives and positive expectations, Park students venture into the world with the knowledge, the confidence, and the skills they need to become successful adults. The school accepts applications for all grades. Main entry points are First Year Kindergarten, Second Year Kindergarten, and Grades 1, 6, and 9. Children must be four years old by September 1 to apply for First Year Kindergarten.